The Message in a Seed thoughtfully outlines the fundamental principles of Shumei Natural Agriculture. After many years of visiting Natural Agriculture farms in Japan, Merriam presents a clear understanding of Natural Agriculture from the western urban consumer’s perspective. The book describes a different way of looking at the natural processes in agriculture from the act of sowing seeds to how the soil nurtures the plant until maturity. Shumei Natural Agriculture is much more than an approach to growing food without the addition of foreign elements such as manure, fertilizers or pesticides. It is a way of life. 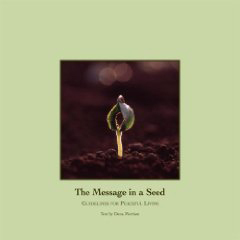 The Message in a Seed describes the interconnectedness between nature, producers and consumers, and the balance between materialism and spirituality that raises our consciousness in creating a more peaceful world. Dena Merriam is a longtime advocate for the environment and worked with the commissioners of the Earth Charter in helping to organize the launch in 2000 at the Peace Palace in The Hague, Netherlands. Ms. Merriam has been involved in environmental and global issues for many years and is the founder of the Global Peace Initiative of Women (GPIW), a non-profit organization that organizes peace dialogues in regions of conflict. GPIW focuses on the relationship between the respect for the environment and building peace in the world community.